Taking significant events in Baptist history, the writers tell the amazing Baptist story of the voluntary approach to the Christian faith in popluar, nontechnical but appealing ways. The intentionally brief chapters are, for the most part, void of heavy, historical notes. Designed as an introductory study for students, laity, and parish ministers, more advanced students will also benefit from a close reading of this text. 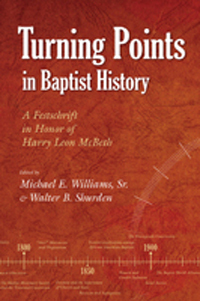 The book is arranged in chronological order so that the Baptist saga can be understood as a continuous narrative. Written to honor the important historical writing of H. leon McBeth, the book celebrates many of the themes that occupied Professor McBeth throughout his career.